How do I Find and Set Up My doTERRA Website That I Get for Free? Please note that this is step #5 in my FREE How to Sell doTERRA Online Training. Click here to see the complete training. Are you a Wellness Advocate? The first thing you need to know is that you need to be a doTERRA Wellness Advocate. 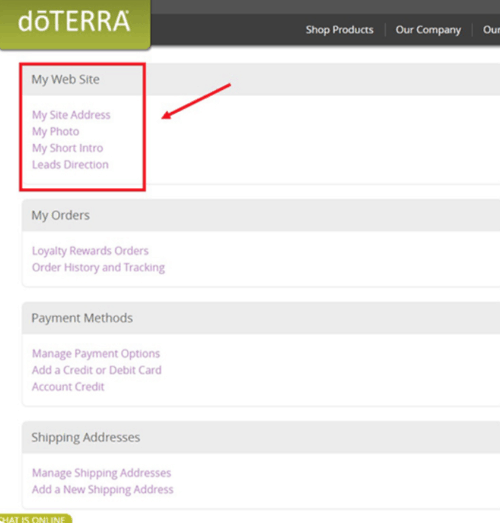 If you signed up as a Wholesale Customer, then you will not have access to your personal doTERRA Wellness Advocate website. However, it’s easy to switch from being a Wholesale Customer to a Wellness Advocate. What’s the difference? The main difference between the two is that as a Wellness Advocate you can sign up people under you IF and ONLY IF you don’t want to. You are not obligated to at all. You would need to give doTERRA your SSN so they can give you a 1099 for taxes if you make over $600 a year. They will not use your SSN for anything else. How Do I Find My doTERRA Website? Within the Account Profile you will find a section labeled “My Web Site” in which a member can update relevant information using the links within the section. You can change the site address and a short intro. Then anyone who wants to join under you just needs to click on that link and then “Join & Save” at the top of the page. It will automatically fill in your Wellness Advocate name and number so you will get credit when they sign up. You can also use this link to sign them up yourself like if they filled out an application at a class you taught or in person. That removes a step for them, but they also may not notice the menu at the top of the page with the links to Essential Oils 101, DIYs and Recipes. But that gives you two options. 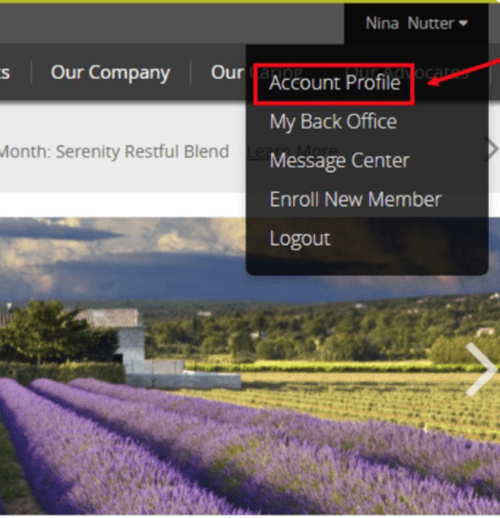 You are supposed to be able to choose if you want leads to be emailed to you directly or through the back office, but this option hasn’t worked for me since doTERRA last updated their website. Please comment and let me know when it works again and I’ll update this post. When I click on the link you left with your name, it looks like your website is customized so you must have figured it out one way or another. Sorry I wasn’t more help. How do I find the join and save link to add to emails?